Made from revised 100% Cult Classic tubing for increased strength and then 100% post-weld heat tre..
We’re bringing you a totally new concept for steer-tubes for BMX that’s not only amazing looking but..
Our 41-Thermal® forks quickly established a reputation for strength and quality when we originally i..
Pre-load Bolt This custom 7075-T6 aluminum pre-load bolt design is included with every Odyssey fo.. The Balance fork is a straightforward modern street fork with a minimal 6mm thick laser cut dropout .. Description:Primo Kamikaze V2 BMX Forks Updated version of Primo’s Kamikaze fork, This version featu.. The Primo Kamikaze V3 Fork is made from 100% chromoly featuring a 1-pc internally machined steerer t.. 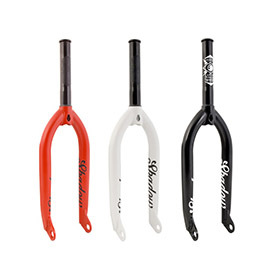 The Primo Pro Fork features a 1pc machined steer tube and post weld heat treated chromoly. Available.. The Primo Strand Fork is a 100% chromoly fork with 1-pc machined steerer tube, hollow aluminium comp.. The Shadow Captive fork spacers are made from CNC machined 7075 aluminum for maximum strength and al.. Revolutionary adjustable offset fork designed exclusively for use with female axle hubs 4130 ..
Anti-Rust ED Coating 6061 hard anodized alloy top cap with 3/8” socket broach 4130 chromol.. The The Shadow Conspiracy "Odin" BMX Fork is the signature BMX fork of Mark Burnett and ma.. The Stranger Ballast IC Fork features full investment cast dropouts. Specifications: Dropout:..
Based on team rider feedback, Sunday introduces the new 28mm offset Nightshift Forks.FEATURES28mm of..